Are we allowed to vote on our own answers? I was wondering. If I tried to vote my own answer up, would that be allowed? To elaborate a bit on what moderator Alexander Gruber said: No you are not allowed to vote on your own post. 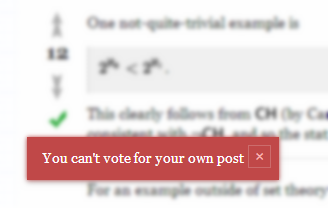 In fact, if you try to vote on your own post, then you will get an error message saying: "You can't vote for your own post". The only way to vote for your own post is to have more than one account and use one account to vote for posts from the other. While it is not illegal to have multiple accounts, you are in no way allowed to have two accounts interact with each other. In particular you are not allowed to use one account to vote on posts made by the other account. The moderators have ways to figure out if this type of behavior takes place and I am sure that they will take prompt action. Not the answer you're looking for? Browse other questions tagged support voting up-votes . How can I delete my own answer? 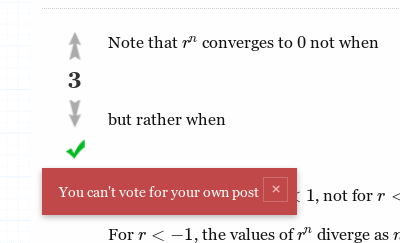 Are picture environments not allowed in MathJax? I still haven't discovered how to vote on MSE or to favorite questions. Is this a bug in me or in my interface? Will implicit down-vote affect my reputation? Can I see deleted answers to my questions? Is there a way to retract a mistaken vote?